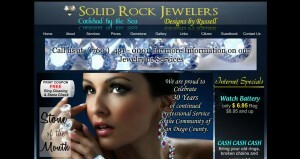 Solid Rock Jewelers address, phone, website, hours of operation, and more. Solid Rock Jewelers, was established in 1981 and is proud to celebrate 30 Years of Services. Our Goal is to achieve excellence. Our Mission is is to provide to you a high-level of service and loyalty. Though our experience and commitment we excel in knowledge and make you our highest priority. We strive to assure the quality of our most treasured jewel: YOU.